Students meet in Grays Hall Basement to discuss the ongoing affirmative action lawsuit against Harvard. 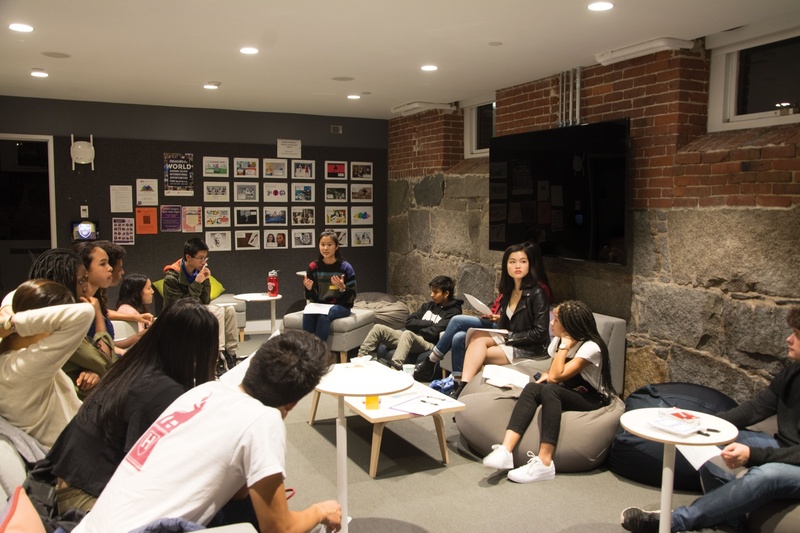 More than a dozen undergraduates ventured to Grays Hall on a rainy Monday evening to enjoy chocolate-chip cookies, recline in beanbag chairs, and engage in conversation about Harvard's admissions controversy. After an ice-breaker activity, the student facilitators asked students to reflect on the words “diversity,” “merit-based admissions,” “racial discrimination,” and “model minority.” Attendees wrote their thoughts on colored notes and placed them on posters around the room. The conversation began with an overview of the history and legal background of the lawsuit pending against the University over allegations that the College discriminates against Asian-American applicants in its admissions process. Organizers distributed copies of a “fact sheet” that provided Harvard’s perspective on its “holistic” admissions process. It also referred students to a University informational website about the suit, as well as to the webpage for Students for Fair Admissions — the anti-affirmative action organization suing the University. Some of the discussion centered around how the case is being discussed throughout the student body. Some students expressed concerns that their peers are uninformed about the case, while others voiced criticism of media coverage of the suit. “I think it definitely makes you realize that there are so many more people who are being affected by it. This topic is not spoken much about. People aren’t discussing as much about this conversation in my immediate surroundings,” Jane Li ’22 said after the event. Many attendees said, though they were concerned about allegations of systematic bias, they were also hesitant to conflate affirmative action with discrimination. Several students said they believed components of the college admissions process — like the personal essay, teacher recommendations, and standardized test scores — are inherently discriminatory and provide an advantage to students of certain socioeconomic backgrounds. Students discussed their personal experiences of the admissions process in the context of their racial identities. About 20 students — including DPE organizers and representatives from the Harvard Foundation, the Harvard Black Students Association, the Harvard-Radcliffe Asian American Association, the Task Force on Asian and Pacific American Studies, and the Harvard South Asian Association — attended the event, which had been advertised over student email lists and on dining hall table-tops. Before closing, facilitators extended an invitation to future discussions about the admissions lawsuit that will be held by several of the racial affinity groups represented at the event. Samantha G. Um ’21 said she appreciated the conversation because of the opportunity it provided to engage students from different backgrounds in dialogue surrounding the controversy. “I think it’s really important for us to have this discussion because there aren’t many events that have happened that foster racial dialogue between different racial groups, so I think that’s one of most important things looking forward in this lawsuit,” Um said after the event. Other students have hosted events to share information about the admissions lawsuit and affirmative action at Harvard. TAPAS held a series of performances in the Yard in September to highlight a public exhibit on the history of affirmative action. Some students have chosen to take even more direct involvement in the suit. Twenty-five student and alumni organizations filed an amicus brief in support of the College’s admissions policies. A number of representatives from these student organizations have even petitioned to testify when the case goes the trial. The trial for the case will begin on Oct. 15 at the U.S. District Courthouse in Boston.